How Francisco Franco borrowed from Spain’s fascist and popular political movements to install a successful dictatorship. 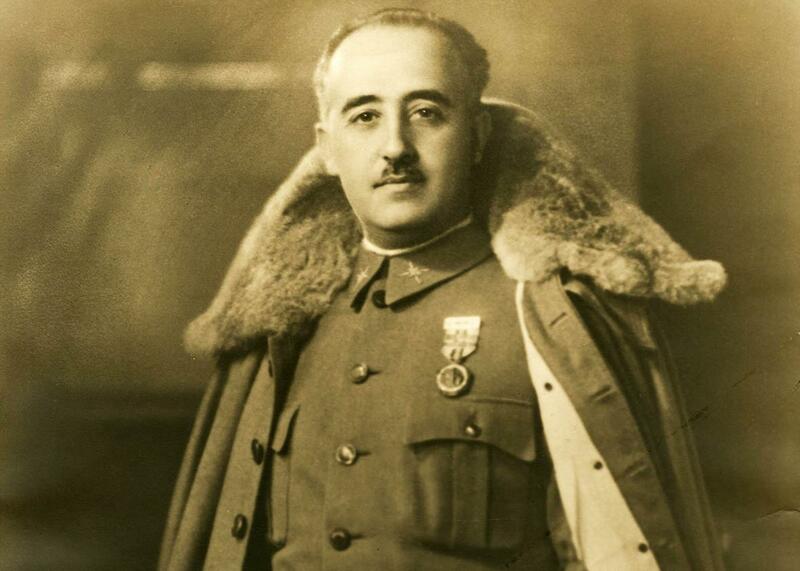 Francisco Franco with a winter cloak. Excerpted from Franco: A Personal and Political Biography by Stanley G. Payne and Jesús Palacios. Published by University of Wisconsin Press. The Nationalist military chieftains who elevated Francisco Franco to supreme power may initially have thought of their leader as a sort of primus inter pares, but this notion did not accord with Franco’s ideas. Though careful in his treatment of leading subordinates, whom he allowed considerable autonomy, he exercised full personal power and firm authority over the military command from the beginning, so that some of those who had voted for him were taken aback by his sweeping, and often distant and impersonal, use of authority. During his first months in power, Franco concentrated on military affairs and diplomatic relations. Politics had been proscribed, with all the rightist forces supporting the new regime, and only the Falange—Spain’s original “fascist” movement—engaged in proselytism, though it was careful not to get in the way of military administration. There was little in the way of political development, however, such matters remaining in the inexperienced hands of Franco’s brother Nicolás, head of the general secretariat of the chief of state. Nicolás had been a competent naval engineer, but in government he quickly morphed into a self-indulgent bureaucrat. He had no particular ideas, other than to safeguard his brother’s power. There was some talk about the need to organize a “Francoist Party,” but this seemed hopelessly artificial and too reminiscent of late dictator Primo de Rivera’s “Patriotic Union.” Franco considered the Primo de Rivera regime his chief precedent, but he kept in mind that the regime had failed for lack of political and institutional development, and he knew that he must avoid such a fate. But how? An important development was the arrival of Franco’s wife, Doña Carmen’s brother-in-law Ramón Serrano Suñer, who entered the nationalist zone on Feb. 20, 1937. On the eve of the civil war, Serrano Suñer was moving toward the Falange, hoping to bring much of the youth from the conservative Catholic party, Confederación Espanola de Derechas Autónomas, or CEDA, with him. Arrested in Madrid, he sat helplessly in prison while his two brothers were executed. A severe ulcer, however, gained his transfer to a hospital, whence, with the help of confederates, he managed to escape dressed in women’s clothing. Doña Carmen was extremely fond of her youngest sister, Zita, and of her brother-in-law. Amid the wartime housing shortage, the couple, together with their four children, were immediately invited to move into the small upper floor of the episcopal palace in Salamanca where the Francos lived. It was left to Serrano Suñer to develop the first steps of the FET and to conciliate and integrate the camisas viejas (literally “old shirts”), the activist veterans of the original Falange, of whom several thousand survived in the Nationalist zone. Newly instated Falange leader Hedilla had been expecting some sort of political unification, but also, naïvely, thought that he would be the leader of the new party. Instead, he was merely named the head of the Political Council, the central political committee. The unification was not popular with either the Falangist or the Carlist militants, but under the existing conditions of total civil war, the immense majority accepted Franco’s initiative. Nonetheless, Hedilla and a small minority of activists, while not rebelling overtly, manifested their recalcitrance. Hedilla was immediately arrested and later court-martialed and sentenced to death, though Serrano had Franco commute this to life imprisonment.7 Over the next weeks and months, hundreds of Falangists who showed a degree of defiance would be arrested. A report given to Franco at the close of 1937 listed a total of 568, of whom 192 were convicted by military tribunals. The FET became a reality, however much cognitive dissonance this generated. The regime’s Press and Propaganda Delegation (Delegación de Prensa y Propaganda) was organized in February 1937, even before the new political system had taken form, and though the cult of caudillaje was a state strategy, it was embraced by newspapers and by many notables and associations within the Nationalist zone. In 1937, the anniversary of his investiture, Oct. 1, was declared the annual Fiesta Nacional del Caudillo. The invocation “Franco, Franco, Franco” was made a slogan equivalent to the Italian “duce, duce, duce.” The style was clearly fascistic. Conversely, there was more stress on strictly military leadership, when compared with Italy, producing the slogan “The caesars were victorious generals.” Key aspects of the effort to achieve legitimacy were thus more praetorian or Bonapartist than fascist. All this may not have been either logical or consistent, but it proved pragmatic and effective in practice. Franco thus became, as the slogan went, “the archetype of the Spanish fatherland,” the incarnation of national mission and destiny, and even more broadly, in the struggle against communism, he was projected as a savior of Western civilization. With his personal authority consolidated, Franco had a tendency to become overweening in a manner quite different from his earlier political comportment. When he presided over meetings of the council of ministers, he talked more and more, pontificating about economic and other technical problems of which he knew little, sometimes to the irritation or amusement of his ministers. Victorious on almost every front and constantly praised by a bombastic propaganda machine, he had become convinced that his role was providential, far beyond ordinary leadership. By 1938 he was convinced that he was an instrument of divine providence, endowed with special powers. If that were not the case, how could his extraordinary career and triumphs be explained? No pragmatic empirical calculation could be sufficient to account for his phenomenal success. Excerpted from Franco: A Personal and Political Biography by Stanley G. Payne and Jesús Palacios. Reprinted by permission of the University of Wisconsin Press. © 2014 by the Board of Regents of the University of Wisconsin System. All rights reserved. 1. R. Serrano Suñer, Entre Hendaya y Gibraltar (Mexico City, 1947), 31. 3. Boletín Oficial del Estado, April 21, 1937. 4. For a detailed account of these events and of the history of the Falange in the early months of the Civil War, see S. G. Payne, Fascism in Spain, 1923–1977 (Madison, WI, 1999), 239–79. 5. Franco, Palabras del Caudillo, 167. 6. S, Martínez Sánchez, “Los obispos españoles ante el nazismo durante la Guerra Civil,” in Ferrary and Cañellas, El régimen, 23–64. 8. Report of May 19, 1938, DGFP, D:3, 657–63.